35 YEARS OF FEDERAL SERVICE in 1978 Martinez was on duty as an EEO Specialist at Fort Bliss, Texas, where he joined LULAC Council NO. 132 of El Paso. He served as Publicity Director for the Texas Council on "La Fiesta de Las Flores" a city-wide community event to select a Queen and to raise over $8,000 in scholarship funds for the youth of LULAC District No. 4. Since returning to Colorado Springs in 1979 he joined Council No. 3006. He has served as all-around volunteer as Treasurer, Advisor, Convention committeeman, education advisor, workshop and seminar coordinator for L.N.E.S.C. He has aided and coordinated in the awarding of over 137 scholarships grants to students in the combined LAEF-LULAC program. RETIRED FROM U.S ARMY 1962 In November , 1973 Martinez was assigned to the Fort Carson Equal Employment Opportunity Program as an EEO Specialist. He was also appointed as the Coordinator of the Hispanic Employment Program and Upward Mobility training for the civilian workforce. He was also utilized by higher ranking officials of the U.S., Army, Fort McPherson, GA, to aid and help conduct seminars and workshops on the Hispanic Employment Program. In January 1978 after transfer to Fort Bliss, TX, the Fort Carson Commander awarded to Martinez, the 35 year pin for meritorious military and civilian service. Also, in June, 1978 while in El Paso, TX, Martinez was cited and given the coveted "Hispanic Employment Program Award" by the U.S. Civil Service Commission, Washington D.C.. In December , 1977 prior to leaving Fort Carson, CO, former commander Major General John F Forrest presented Martinez the "Outstanding Manager and Technical Award for his services to the U.S Army in Equal Employment Opportunity. Prior to civil service retirement in November, 1979, MG John J. Koehler, Jr., Fort Bliss, TX Commander cited Martinez upon his receipt of an Outstanding Rating and commended him for his energetic and progressive affirmative action accomplishments. At the same time, the El Paso League of United Latin American Citizens Council No. 132 cited him for his community outreach assistance in equal employment opportunity programs involving LULAC District No. 4 in Western Texas, and for forty one years of LULAC service. The feats and accomplishments of Martinez have always been conducted with enthusiasm and for the welfare of all American citizens. He is one of the few Hispanics in Colorado who rose through the ranks in the military profession from Private to commissioned officer, troop commander and staff official in the US Army Transportation Corps. He achieved the rank of Lieutenant Colonel in 1960 and retired on 6 Sep 1962. In the communities where he operates, he has never lost the common touch among his fellow citizens. He assists and lends a helping hand to whomever approaches him. He is truly one of Colorado's great humanitarians in service to God, Country, Family, La Raza and the community groups in which involved in Colorado. To assist and help the elderly citizens in El Paso County and the Pikes Peak region, Martinez was selected by the Silver Key Senior Services Board of Directors in 1980. He was named to chair the Social Services Committee which handles home care, maintenance, companionship, vials of life and elders on the Postal Alert Program. he is the board coordinator on Hispanic elderly and works directly with minority groups to ensure that the services of Silver Key are reaching down to the grass roots level in the community. His wife, Eralia I. Martinez is a volunteer also in the Social Services. On May 11, 1981, Martinez and his wife were both awarded Silver Key Certificates of Service for their volunteer performance in helping senior citizens in El Paso County. 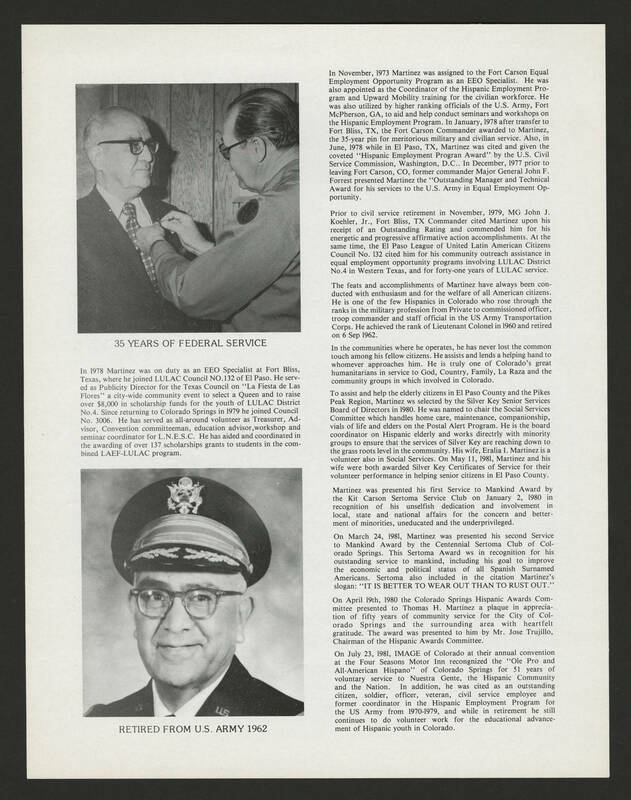 Martinez was presented his first Service to Mankind Award by the Kit Carson Sertoma Service Club on January 2, 1980 in recognition of his unselfish dedication and involvement in local, state and national affairs for the concern and betterment of minorities, uneducated and the underprivileged. On March 24, 1981, Martinez was presented his second Service to Mankind Award by the Centennial Sertoma Club of Colorado Springs. This Sertoma Award was in recognition for his outstanding service to mankind, including his goal to improve the economic and political status of all Spanish Surnamed Americans. Sertoma also included in the citation Martinez's slogan : "IT IS BETTER TO WEAR OUT THAN TO RUST OUT." On April 19th, 1980 the Colorado Springs Hispanic Awards Committee presented to Thomas H. Martinez a plaque in appreciation of fifty years of community service for the City of Colorado Springs and the surrounding area with heartfelt gratitude. The award was presented to him by Mr. Jose Trujillo, Chairman of the Hispanic Awards Committee. On July 23, 1981, IMAGE of Colorado at their annual convention at the Four Seasons Motor Inn recognized the "Ole Pro and All-American Hispano" of Colorado Springs for 51 years of voluntary service to Nuestra Gente, the Hispanic Community and the Nation. In addition, he was cited as an outstanding citizen, soldier, officer, veteran, civil service employee and former coordinator in the Hispanic Employment Program for the US Army from 1970-1979, and while in retirement he still continues to do volunteer work for the educational advancement of Hispanic youth in Colorado.